Where to find Port of Spain hotels near an airport? Where can I find hotels in Port of Spain that are near tourist attractions? If you're thinking of traveling through Trinidad and you're after a hotel in Port of Spain, you'll find a wonderful assortment to choose from. Spend some time exploring Expedia's 41 accommodation listings, which are all within a 0.1-kilometre (0.06-mile) radius of downtown Port of Spain. Within a 1-kilometre (0.6-mile) radius of Port of Spain's center, travelers can enjoy a range of hotels, including the Hyatt Regency Trinidad and Radisson Hotel Trinidad. 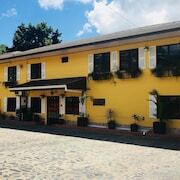 The Inn at 87, Forty Winks Inn and Melbourne Inn Trinidad could be good choices for those travelers seeking more economical accommodation. The Courtyard by Marriott Port Of Spain is situated 3 kilometres (2 miles) from the middle of Port of Spain. 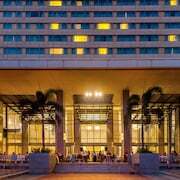 Alternatively, the Hilton Trinidad & Conference is situated 2 kilometres (1 mile) away. The Holiday Inn Express Hotel & Suites Trincity Trinidad Airport and the Kapok Hotel are alternative places to book accommodation around Port of Spain. Gulf View is situated 12 kilometres (7 miles) to the east of Port of Spain. While here, be sure to experience the Mount St. Benedict Monastery. St. Augustine is blessed with some nice places to spend the night. 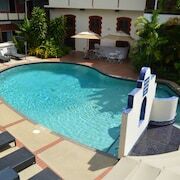 Or, you can stay at Gulf View, 45 kilometres (27 miles) to the south of Port of Spain. While in Gulf View, be sure to check out the Gulf City Mall. The Tradewinds Hotel and Sunset Ridge Apartment are all good places to stay. Get your sporting fix by making a journey to Queen's Park Oval, which is 3 kilometres (2 miles) to the northwest of Port of Spain. 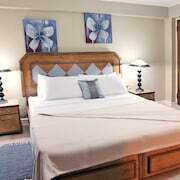 For tourists who are keen on booking accommodation nearby, make a reservation in the The Carlton Savannah or L'Orchidée Boutique Hotel. If you are traveling into or out of Piarco International Airport and are looking to stay nearby try Regent Star Hotel or Piarco Village Suites. What are the most popular Port of Spain hotels? 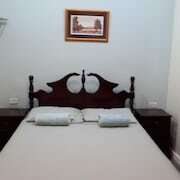 Are there hotels in other cities near Port of Spain? 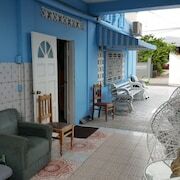 What other types of accommodations are available in Port of Spain? Explore Port of Spain with Expedia.ca’s Travel Guides to find the best flights, cars, holiday packages and more!